Schoolchildren in secondary school no. 1, Stepanakert, Nagorno-Karabakh. Photo (c): Ilya Pitalyev / RIA Novosti. All rights reserved. The four day war over Nagorno-Karabakh last year took the populations of both the disputed region and Armenia completely by surprise. The events of that April reopened old wounds in a long-simmering conflict which has defined Armenia and Azerbaijan since the dying days of the Soviet Union. Several months after the escalation, while taking part in an international project, I got to meet colleagues from Azerbaijan and shared a room with them. It was only on the last day that we decided to talk about the sensitive issue of Karabakh, exchanging impressions and discovering how far they overlapped, while understanding that we would have little in common. After listening to one of my new acquaintance’s stories, all I could say was, “the same happened to us”. Our recollections of the war were mirror images of one another, with one difference: for some of us, the war and all its atrocities were initiated by Armenia; for others, all the barbarity was down to Azerbaijan. I had also had conversations like this when I was young. We Armenians compared our history books with those studied by our contemporaries in Azerbaijan. Our perceptions seemed identical in form and the absolute opposite in content. This mirror image has long played a central role in the enmity between our two countries. As history is written for the generations that follow us, it’s imperative to take a critical look at how it’ll be interpreted. 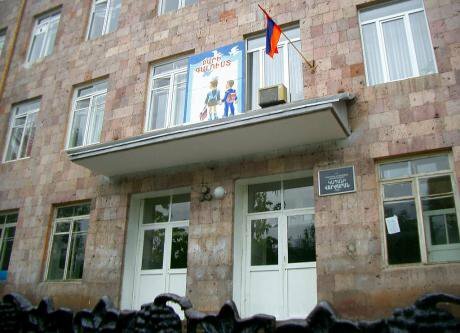 In 1993 the first generation of schoolchildren in independent Armenia received new textbooks – until then pupils studied with books from the Soviet period. The new textbooks’ authors had to somehow introduce their readers to the concept of statehood. And 25 years later, historians are still trying to find new ways of teaching history in a way that won’t provoke fear and hatred in this new generation – for whom the four day war could be a formative experience. After Armenia declared independence in 1991, its new government set up a team of historians led by academician Vladimir Barkhudaryan, which remains the main editing body for history textbooks. Since 2010 professor Ashot Melkonyan, the president of the country’s institute of history, has been working on new textbooks – he admits that the first editions were received critically. “This happened with both Barkhudaryan’s work and our 2010 editions”, he tells me. “We’re specialists, we use academic language. After talking to teachers we decided to make the books more pupil-friendly”. The 2015 editions feature fewer dates and names, though the basic content remains unchanged. “A country without a past can’t be independent, so history is important”, says tenth grade student Anna. But although these students value history, they admit that learning dates isn’t easy. “I love history lessons”, says Anna’s classmate Hovsanna. “The more you read, the more you realise how important it is. But it’s hard to remember all the dates, names and events”. An ingrained historical narrative was not the only problem facing the authors of the new generation of history books. “The long absence of statehood has affected Armenians’ self-image, so the main aim of our first textbooks was to develop a national consciousness among schoolchildren”, Melkonyan says. “The generation that promoted the idea of independence had to grapple with the various problems it entailed and ended up nostalgic about the Soviet past. But we need to understand that the new generation of free thinkers born after the Soviet era would never choose to live in such a system”. 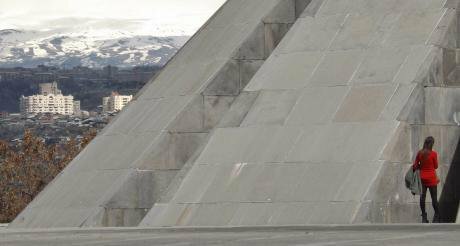 The Tsitsernakaberd memorial complex in Yerevan, dedicated to victims of the Armenian Genocide. Photo: CC-by-2.0: Shahnahan / Flickr. Some rights reserved. After independence, the study of Armenian history became one of the most important elements in nation-building. A collective image of the Armenian nation, an “us” that includes the idea of a people standing up for its sovereign rights has emerged over time. Equally a “them” has been created – symbolising a force that has deprived Armenia of statehood in the past. Although Armenian schoolchildren can now find out about the Armenian genocide and the Nagorno-Karabakh war outside the classroom, textbooks remain the main source of knowledge of the past. A survey conducted in 2013 by the education-orientated NGO Barev and the Open Society Foundation Armenia revealed that nearly 60% of students saw textbooks as their key source of information. The NGO Imagine, an interregional centre for conflict resolution, is cooperating with a partner organisation in Turkey in an analysis of history textbooks in the two countries. This involves academics and teachers on both sides producing a critique of existing models of history teaching. Their conclusions are not reassuring: prevailing practices promote enmities, so only lead to the perpetuation of conflict. “It’s a known fact”, says Balasanyan. “If you want to rule, you need to create the image of an enemy that presents a threat to your country’s security. This approach is usually evident when “they”, “the others” – non-Armenians – are discussed. It doesn’t matter whether “they” are a Muslim neighbour or the leader of another Armenian dynasty who has usurped the throne. Students are aware of this too. “In our history textbooks Turkey was always identified as the enemy”, says Narek Babajanyan, a 20 year old student at the American University of Armenia. “This was to some extent true, but clichés like this don’t always reflect political realities. In the 1920s, some members of the Armenian Revolutionary Federation [often known as the Dashnaks – ed.] tried to initiate friendly relations with Turkey, to avoid being under Soviet rule. The Soviet Armenian national anthem included the words, ‘October, the breath of fresh air that has given us life. You saved us, the Armenian people, from inevitable destruction…’ Meanwhile, Armenian politicians were ready to cooperate with Turkey in order to flee from that ‘October’”. Teachers have a hard time covering sensitive subjects such as the Armenian Genocide or the Nagorno-Karabakh conflict without traumatising their students. The section on the Genocide in the 8th grade textbook [designed for students aged 15-16 – ed.] published in 2013 begins with an explanation of the term and a detailed account of the massacre of Armenians: “The most serious consequence of the genocide was the extermination of the population of Armenia and the displacement of Armenians from the larger part of our homeland – Western Armenia”. This is one of the few places in the book where its authors switch from a neutral third person to a first person narrative, to accentuate the tragedy for every Armenian. 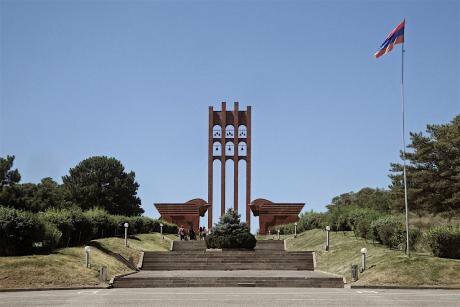 The monument at Sardarapat in Armavir province, where an Armenian army defeated the Turks in May 1918. Photo CC-by-2.0: Vahe Martirosyan / Flickr. Some rights reserved. Throughout history, the role of the enemy has switched from one outside force to another: Persians, Romans, Byzantines, Mongols, Seljuk Turks and, later, the Soviet Union. Newer textbooks devote special attention to the latter. Political analyst Mikayel Zolyan believes that the influence of the Soviet Union is not seen as an absolute good nowadays, but a relative one: “recognising its positive role in providing physical security for Armenia within its empire and the opportunity to develop the culture of the Eastern part of the country. But at the same time, the authors recognise the colonial nature of the Russian government”. Anthropologist Tigran Matosyan has carried out a comparative study of Soviet and post-Soviet textbooks on Armenian history and shown how narratives can change depending on geopolitical circumstances, taking as an example the uprising organised by the Bolsheviks in May 1920 that brought the First Republic of Armenia, created in 1918, to an end. “The heroic May Uprising is a glorious page in the history of revolutionary movements in Armenia: a powerful movement that dealt a serious blow of national significance to the Dashnaks”, reads a 1987 textbook. “The May Uprising was an important lesson for the Communist Party and labouring masses of Armenia. Thanks to it, they developed a political maturity that played an enormous role in the victories of the future”. A 1994 textbook presents a rather different picture: “The May Uprising was doomed to failure: it was weak, sparse and disorganised. It merely harmed the interests of the Republic of Armenia”. As for the Nagorno-Karabakh conflict, the new textbooks criticise the unfair redistribution of territory, blaming both Azerbaijan and Russia. An extract from the 2014 tenth grade textbook [for students aged 17-18 – ed.] reads: “Relations with Azerbaijan were difficult. Territorial-border disputes were exacerbated. Azerbaijan was determined to get hold of Nagorno-Karabakh, Zangezur, Nakhichevan and other lands. England, Turkey and, from spring 1920 onwards, Soviet Russia, took the side of Azerbajian”. A description of this kind would have been impossible in a Soviet textbook, although the images of the “the other” differ. As Hayk Balasanyan points out: “in our history textbooks, the Russian Empire is always portrayed as the best of a bad lot. Arabs, Turks and other invaders have a much more negative image”. Azerbaijan is generally described in Armenian textbooks as a new country, conjured up by rootless nomads. Epithets describing Azerbaijanis are similar to those used to describe other tribal groups “…armed warfare broke out between Armenians and the local Muslims (Caucasus Tatars, today’s Azerbaijanis)”. This is one of the first references to Azerbaijanis from the eighth grade textbook, where for the sake of clarity the Tatars are linked to today’s Azerbaijanis, so accentuating their tribal roots. Another problem with Armenian textbooks is the creation of anachronistic parallels between the self-conception of ancient and modern Armenians. The present Nagorno-Karabakh conflict is also seen through the prism of this past. When discussing to whom Karabakh belongs (or should do), both sides hark back to antiquity. The Azerbaijani side argues that Karabakh was once part of Caucasian Albania, on the territory of today’s northern Azerbaijan. To Armenians, Karabakh was always part of their ancient province of Artsakh. In other words, the two sides are attempting to resolve the Karabakh question using facts from the past, not the present. 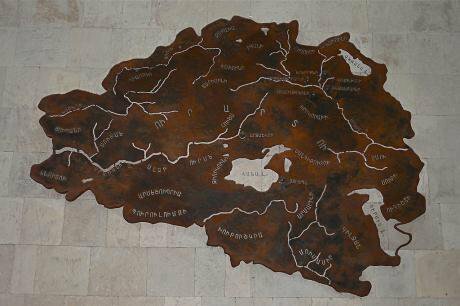 On the wall of the Armenian National History Museum in Yerevan hangs a map of Urartu, the ancient civilisation which flourished on the Armenian Highlands in the 13th century BCE. Many scholars in Armenia today have traced the ethnogenesis of the Armenian people back to the ancient kingdom. Photo CC-by-2.0: Rita Willaert / Flickr. Some rights reserved. In 2017, Imagine is organising workshops for people from both sides of the conflict, with the express purpose of changing thought processes around the unresolved conflict. The goal of the workshops is to widen people’s horizons and identify effective tools for transforming conflicts - whether social networks, journalism or historiography. People attending the workshops compare and contrast their knowledge of the history of the conflict, to get a feel for the conflicting narratives on either side. For Armenians, the main thing is to overcome their perceptions about the antiquity of Armenia and the victim mentality that dogged them for many years. A readiness to sacrifice oneself for one’s country is also a key trait. Vardan Mamikonyan, for example, led an uprising against the Sassanids in 451 CE, after they imposed Zoroastrianism on the Christian Armenians. His antagonist Vasak Syuni, who crossed over to enemy, is still remembered by most Armenians as a traitor. However, historian Nikokhayos Adonts claims that Vasak in fact tried to negotiate with the Persians, while Vardan Mamikonyan, blinded by patriotism with little hope of victory, was killed at the head of his small rebel army. He, however, is a saint of the Armenian Apostolic Church while Vasak is reviled. The conversation around self-sacrifice in the cause of freedom is not only found in Armenian history textbooks. Maria Karapetyan gives me an example from the introductory letter to students of a literature textbook. “The text read something like this: the guarantee of the immortality of a nation lies in the self-sacrifice of its every member”, she quotes. “It’s paradoxical, isn’t it? People should die so that the collective can survive”. According to Karapetyan, in many complex situations it turns out that those who support the powers that be are heroes, whatever the circumstances, and everyone else is a traitor and enemy. Student Narek Babajanyan recalls a typical joke: someone asks, “Who are the Armenians?” The reply comes: “Call them on 301-405-1988”. This quip underlines the key elements of Armenians’ self-identity: 301 was the year they adopted Christianity; 405 the year the Armenian alphabet was created and 1988 the outbreak of the Nagorno-Karabakh war. This perception is closely reflected in the way Armenian history is taught in the country’s schools: in the early years of independence, children were educated in the history of the entire Caucasus region. In the middle years they covered Armenian history from antiquity to the 2000s; over the last two years they’ve continued this approach but focus on more controversial issues. The national curriculum adopted in 2011 defines the obligatory minimum and maximum academic load. In an effort to move towards Western teaching practices, it incorporates human rights, multiculturalism and peacebuilding. My respondents stressed that history teaching in Armenia today takes a more accurate and neutral perspective, with simplistic images of “others” gradually disappearing. Nonetheless, historians still have work to do. Studies of school curricula and teaching qualifications show that not all education specialists have taken to the new approach. Most teachers began their careers in the Soviet years and still use Soviet teaching methods, based on rote learning and the regurgitation of chapters from the textbooks. A school in the southern city of Kapan, Syunik province. Photo CC-by-NC-2.0: Adam Lederer / Flickr. Some rights reserved. In their final school years, students spend a lot of time preparing for final tests, which require them to know dates, names and historic events. They understand the facts, but not the logic, of historical events. “We have never supported the use of tests as a way of examining students”, Professor Melkonyan tells me. “But we have to make adjustments to the textbooks in line with the tests, and vice versa. This process affects our students’ analytical skills”. Hayk Balasanyan proposes compiling anthologies from historical sources and textbooks, giving students a chance to compare and contrast facts and analyse information independently. During the four day war, students collected supplies and gifts to troops in Karabakh, writing letters and essays about how they longed to join the fight when they grew up. Despite these traumatic events, Sos Avetisyan, a researcher with Imagine, believes that school students will inevitably be drawn into the conflict. “The army is one of Armenia’s largest social institutions, and almost every family has someone, or at least knows someone, serving in it”, he says. Until recently, discussion around patriotism focused on the Nagorno-Karabakh war of 1994. That conflict was beginning to feel like a remote myth to young people, but now they hear real stories from soldiers who were on the front line only last year. “In a full scale war, it’s normal to have a negative attitude towards your enemy”, adds Avetisyan. The events of last April have been yet another to dialogue between Armenia and Azerbaijan, which still doesn’t exist even on an academic level. 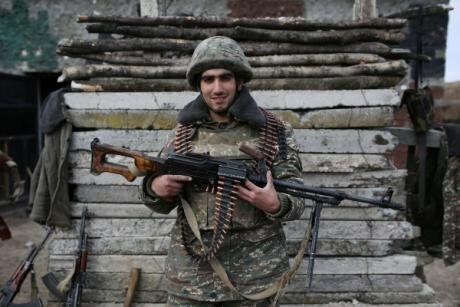 An Armenian soldier on the front line in Nagorno-Karabakh, April 2016. Photo (c): Karo Sahakyan / RIA Novosti. Some rights reserved. Conflicts will continue, and the four day war will be added to the history textbooks of tomorrow. But this cannot become yet another excuse for blind hatred between the young people of Armenia and Azerbaijan. Teacher and textbooks alike should be a healthy influence on new generations. Though discussion and cooperation between conflicting sides will not inevitably lead to a single truth, the opportunity to listen to one another could help people find a common narrative, at least where the past is concerned. We as much to future generations.